Deadly Secrets is the fifth Art of Murder game for PC that plays as a hidden object game instead of being a 3rd-person point and click adventure. Following the gameplay style of its predecessor, Art of Murder: The Secret Files, you are once again cast in a role of FBI agent Nicole Bonnet in search for a serial killer. 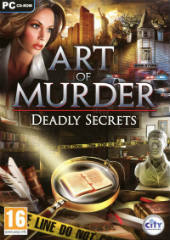 Someone is killing antiquarians and collectors in New York city, all of which are seemingly unrelated, but after investigating the crime scene of the most recent victim, the case takes a turn for the better and Nicole uncovers the connection between the murders. Now she has to follow the clues and catch the killer before he claims the life of the next victim. The game, as its predecessor, has no voice-acting and Nicole interacts with the environment in a first-person, whether to talk to the characters, look for clues, or to search for hidden objects.